Arsenal midfielder Alexander Hleb is set to be sidelined for three weeks after damaging a hamstring while on international duty with Belarus. The 26-year-old picked up the injury during the 2-1 Euro 2008 qualifying victory over Holland on Wednesday. Hleb, who has been in fine form, will miss the visit of Wigan on Saturday and is likely to be ruled out of Arsenal's two remaining Champions League games. "He will be out for 21 days," boss Arsene Wenger told the club's website. 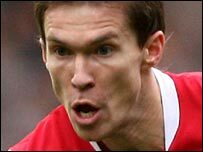 Hleb, who has played a key role in Arsenal's rise to the top of the Premier League table, will also miss away games at Aston Villa, Newcastle and Middlesbrough. How sorely will Hleb be missed by Arsenal? Wenger is short of midfield options for the visit of managerless Wigan with Mathieu Flamini (thigh), Cesc Fabregas (suspended), Abou Diaby (back) and Gilberto (fatigue) all unavailable. Defender Philippe Senderos returns but striker Robin van Persie's has not yet recovered from a knee injury sustained on international duty with Holland in October. "Hleb came back with a hamstring injury," added the Arsenal boss, who has long been frustrated by his players returning from international duty with injuries. "So once again we lose someone during this period."